San Gimignano is a gorgeous Tuscany-inspired restaurant inside the Imperial Hotel with an outstanding selection of fine wine and a line-up of classic Italian dishes which is perfect for a romantic date with your sweetheart. This fine-dining restaurant is romance personified with wooden walls, black and white photographs of the namesake Tuscan town, and an all-white outdoor section called Paradiso Divino (replete with an aesthetic courtyard and alfresco seating – perfect for a date). Bookmark this one for when the weather is nice. The ambiance is quiet and soothing, and their attentive waiters will make sure that your needs are well taken care of. 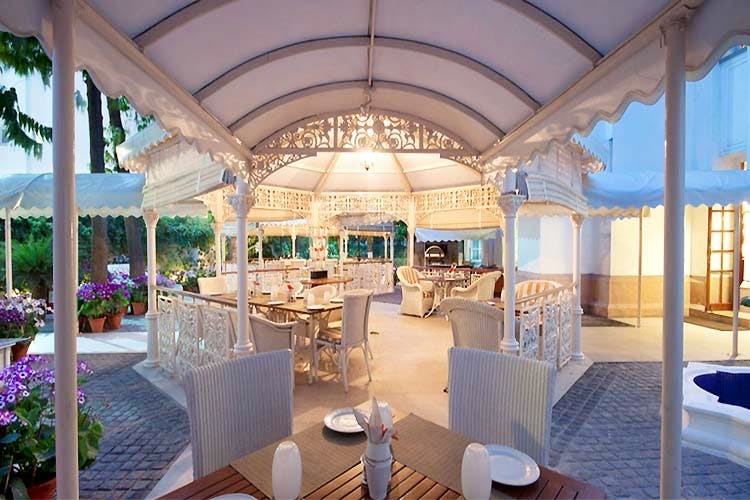 Their traditional, Italian menu has ample variety for both veg and non-veg lovers, and has been curated to go with their selection of straight-from-Italy wines and grappa. We hear their pizzas are perfectly thin, crispy and to die for. You can also try the risotto, and the tiramisu. Health-freaks can choose from the Sano menu, which has all kinds of healthy alternatives. PS. This isn’t the sort of place you can saunter into in your ghar ke kapde – there’s a smart-casual dress code, and it’s very shorts-and-shoes-equal-no-service. Check out this place on an extravagant date night – we’re crushing on it for its elegant decor and the imported (albeit expensive) wines. Bear in mind that the place is only open strictly during lunch and dinner hours. Also, don’t forget to book a table in advance.